This image depicts the St. Louis Cahedral as it stands todday. Be sure to compare it to the depiction in 1817. This image depicts how the St. Louis Cathedral looked in 1817. Pay special attention how this compares with the current picture of the Cathedral below. Plan of the City and Suburbs of New Orleans from an actual survey made in 1815 by J. Tanesse City Surveyor,” Jacques Tanesse (original), published by Charles Del Vecchio of New York and P. Maspero of New Orleans, April 29, 1817. engraving at The Historic New Orleans Collection. This image depicts a marriage procession at Goree in 1806. Pay special attention to the details and lavish qualities of music and dress. 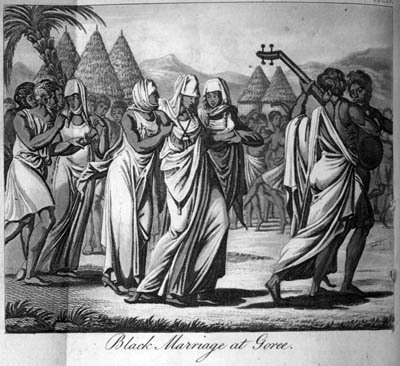 "Marriage Procession, Senegal, 1806, as shown on www.slaveryimages.org, compiled by Jean Baptiste Durand"
This image depicts a Signar in Senegal. Pay attention to the way she is shown larger than her surroundings and appears to command power and respect. 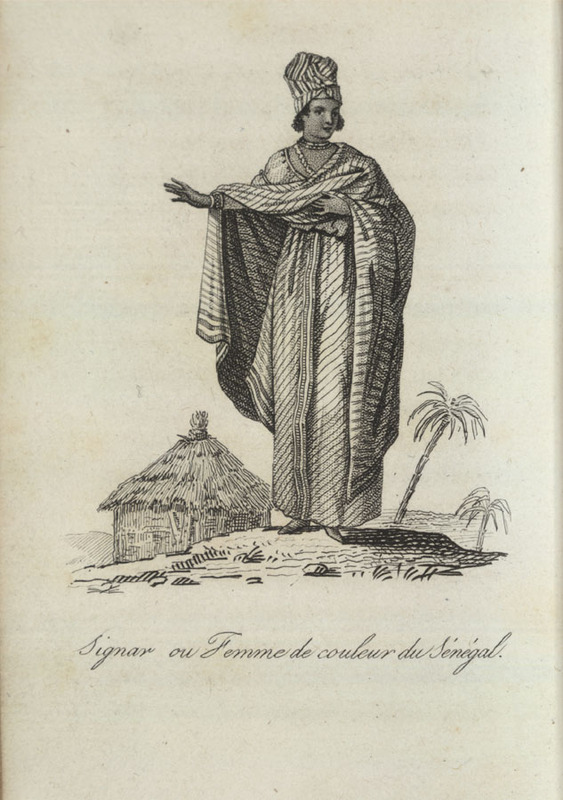 "Free Woman of Color, Senegal, 1780s, as shown on www.slaveryimages.org, compiled by Rene Claude Geoffrey de Villeneuve, and sponsored by the University of Virginia Library"
This image is a scan of the original Napoleonic Code published in 1803. 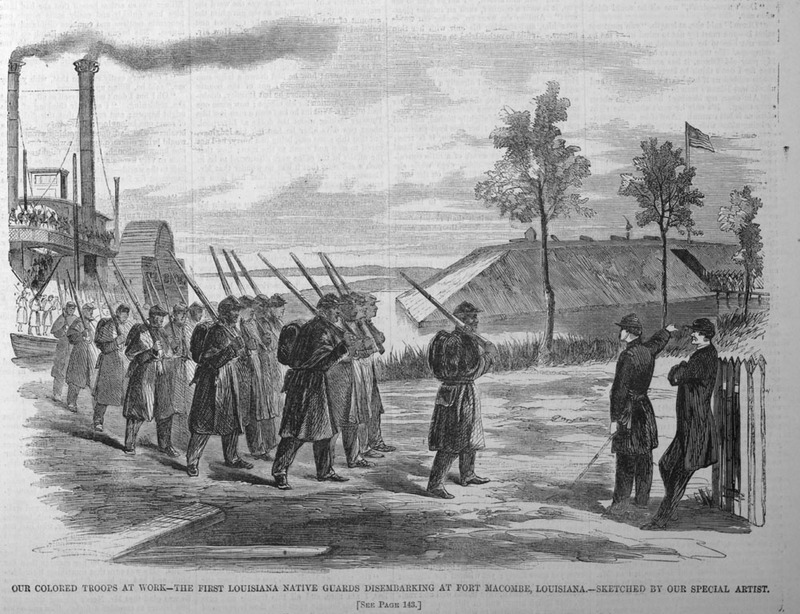 This image depicts the troops of the Louisiana Native Guards being given orders. Pay special attention to the organized manner with which they march. "First Louisiana Native Guards, 1863, as shown on www.slaveryimages.org, compiled by Harper's Weekly"
Eduardo Dejan (a former slave and native of Martinica) and his bride Maria Theresa Luisa (free woman of color and native of New Orleans) went through many hardships before their marriage in the St. Louis Cathedral. They were like thousands of other couples who have wanted to get married in the historic Cathedral, but their marriage was in 1794 which made it all the more special. Being people of color in New Orleans at the time, their marriage was not as widely accepted as those of white people. This does not mean that their marriage was secret or banned. In fact, it is highly likely that their marriage was celebrated and a symbol of progress for people of color in the New Orleans. The presence of Manuel Carrier, captain of the Free Black Militia at the time and a man who bore witness to many marriages between people of color shows the true gravity and respect given to the marriage. You might be interested to find that the institution of marriage in New Orleans at the time strongly resembled marriage in the French colony of Senegal. Because many of the slaves that were brought to New Orleans were from Senegal, the culture that emerged in this city is inextricably linked back to Senegal. The evolution of the institution of marriage ceremonies and its implications in Senegal and the French founded colony of Nouvelle-Orléans (presently, New Orleans) often held much more meaning than just the union of two people. These ceremonies held nuanced (and sometimes overt) messages surrounding class, race/ethnicity, and religion. The institution of marriage and its implications is an interesting indicator of the culture in which it is found. Senegal and New Orleans, both places colonized by the French, are perfect examples of this phenomenon. While they may have stark differences, their cultures and histories are inextricably linked in ways that can be seen through the historical, social, economic, religious, and political implications of marriages. In the French colony of Senegal, the French expected the native Senegalese to conform to their religion, Catholicism. One way they ensured this transition was to require marriages to be Catholic ceremonies performed in the Catholic church in order for them to be legally and culturally recognized by the French. As religion conformed to the French approved Church, so did marriage. Marriage in Senegal was often more of a mutually beneficial trade than a union of two people in love. Marriage tended to be to another person of equal or higher standing in society in order to secure or advance the family name in French society. Because marriage was so symbolic to a family’s standing in society, the marriage process was long and detailed. It included a long courtship process (lasting from one to four years), family approval, dowry, negotiation and formal contract of property rights, and many marriage traditions we see today such as a white dress, ornate head piece, marriage gifts, and a celebration with food, song, and dance. Those most likely to have marriages that adhered closely to what was just described were the Metís families of Senegal. The Metís were a group of mixed race people who settled in Senegal and tended to be traders and merchants for the Europeans. Through this trade they asserted themselves into society and politics as elite families. Due to their business connections with the French they were most likely to conform to their religion and demands of marriage. Conforming to the French bourgeois expectations gave a family higher standing while also limiting the pool of eligible marriage candidates which in turn created a small group of intermarried Métis families. By the nineteenth century almost all the Métis were related by marriage which led to stagnation and decline in the population. The marriage records of Saint Louis from 1885-1890 show that most recognized marriages were between Métis families, or between a Métis and a European (although four were between habitants and African women). To the Métis, the ability to trace family lineage back to a marriage between a signare and a European man gave the family a particularly high standing. With the conformation to French civil law, came a scrutiny over the private lives of those living in Senegal with particular attention to women’s rights, adultery, children out of wed lock, sexual immorality, and inheritance. 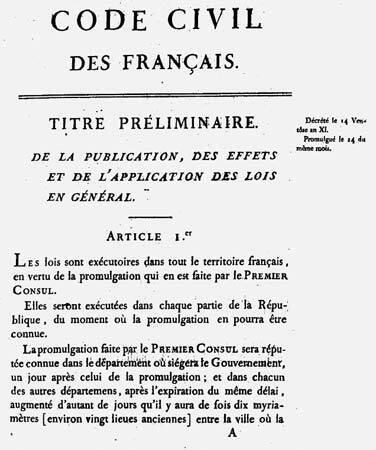 These scrutinizing debates led to the official application of French civil code to Senegal in November, 1830 which resolved the disputes and was the basis for the Senegalese claim citizenship. This code solidified many race and class relations through the institution of marriage. The code specified that polygamy was prohibited, instructed civil marriage ceremonies (these regulations were heavily influenced by Christianity), differentiated a legitimate child from a child out of wed lock, and gave instructions for inheritance. Although not specific in the code, colonial authorities rejected mariage à la mode du pays (marriage of an African woman with a European man). The application of, and willing conformation to the French civil code was highly contested by some groups within Senegal at the time, especially the Muslim community. This unhappiness did not stop the code from becoming widely recognized. French colonial rule brought about a severe change in how the institution of marriage was viewed and conducted. The shift in the institution of marriage within Senegal also signaled a shift in race relations, religion, and culture. The drive towards fulfilling expectations of the French bourgeois caused marriage to become a business transaction in the sense of dowry and whom the marriage was between, but it also took on many celebratory (still in the French manner) qualities such as the festivities that occurred after the ceremony itself. This testimony from the Works Progress Administration’s Federal Writer’s Project shows that ultimately slaves were seen as less than people and females were especially abused in order to perpetuate slavery. In addition to marriages forced by slave owners, it is important to note that many slaves married for love. Because so many slaves in New Orleans were taken from Senegal, these unofficial marriage ceremonies often had resembled traditional marriage ceremonies in Senegal. After the Civil War, many couples and families that had been separated through the slave system or during the war had to go through a great deal (many had to walk long distances, and/or send multiple letters to federal agencies and churches) to find their loved ones again. Because the right to official marriage recognized by the law was one of the main tenants of emancipation, many marriages between former slaves occurred after emancipation. This ability to marry under the eyes of the law and the Church also assisted in the spread of religion through the former slave population. The liveliness and grandeur of these ceremonies depended on the perception of emancipation. While many former slaves embraced the idea of formalization and legalization of marriage, there was a significant subset that believed legalization would result in further interference and even danger to their relationship. Because of these doubts, there is evidence of coercion from the federal government and some missionaries to participate in the marriage officiation process. On the whole though, most free people of color embraced their right to a legal and recognized marriage. Many of the marriage records of this time show witnesses from the Free Black Militia. The Free Black Militia was instrumental in encouraging people of color to get married in New Orleans which shows that the implications of marriage between people of color go beyond just rights. These marriages show the progress and celebration of people of color in New Orleans. 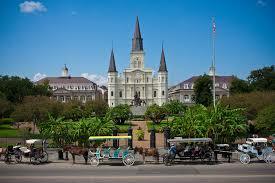 One of the most iconic wedding sites was the Saint Louis Cathedral. A common myth surrounding marriage in the beautiful Saint Louis Cathedral is that mostly marriages between, and attended by wealthy white people were held there. For the most part, this myth stems from the fact that tours and readily available information about the Cathedral focuses on famous marriages between white elites. In fact, the marriage records show that a great deal of marriages held in the iconic Saint Louis Cathedral were lively ceremonies involving many people of color. Furthermore, there is little emphasis on the architectural changes that have taken place over the years which can be seen in the two images on the right. Additionally, marriage and creation of a family between two people of different races became more accepted during this time. Many men who had illegitimate children with women of color began to claim their children as their own which gave these children and their mothers more respect and agency in New Orleans society. The evolution and implications of marriage in New Orleans changed greatly between the time slaves were brought over and emancipation. From being strictly unofficial and unrecognized to being held in grand locations such as the Saint Louis Cathedral, marriages shifted along with the meanings of race, religion, and status. While the institutions of marriage in Senegal and New Orleans hold many different aspects, it is important to also examine their likeness and the features that tie the two places together. While marriage in Senegal was a process involving the entire family due to its potential to climb the social ladder, marriages in New Orleans had much more to do with the perpetuation of slavery or love. We must note that both of these places held a high emphasis on race and social status. Senegalese marriages hoped to gain social status by marrying into the European blood line and diluting the African roots. Many former slaves that had been involved in relationships with white men (many of whom bore children as a result of these relations) gained higher status if the father claimed the child and sometimes married the mother. Additionally, some women in Senegal were seen as only suitable for extramarital relations simply because of their skin tone. This creates a direct parallel to the way the relations between white men and slave women were seen in New Orleans. The aspect of race in marriage in New Orleans is highly emphasized. Much of this is due to the fact that many marriages were not recognized in the eyes of the law or the church until after emancipation. Furthermore, the spread of religion often came through marriage and the drive to be recognized by French law in both Senegal and New Orleans. Because the French civil code would only recognize a marriage if it was officiated by the Church, this led to the adoption of the Church for many who wanted to have legalized marriages and secure their citizenship in French society. The long-held tradition of marriage is a highly respected and informative indicator of culture and state of race, social, economic, and political relations within a society. The examination of marriage ceremonies and their implications within the societies of Senegal and New Orleans show their cultural and historical ties as well as the ways the different circumstances within each place forged the differences between them. Ingersoll, Thomas N. “Free Blacks in a Slave Society: New Orleans, 1718-1812.” The William and Mary Quarterly48, no. 2 (1991): 173-200. doi:10.2307/2938067. “Acts of Marriage for the Commune of Saint Louis,” Civil Registry, 1885-90, ANS. Jones, Hilary. The Métis of Senegal: Urban Life and Politics in French West Africa. Bloomington: Indiana UP, 2013. Print. Woods, Earl C., Charles E. Nolan, and Dorenda Dupont. 1987. Sacramental records of the Roman Catholic Church of the Archdiocese of New Orleans. New Orleans, La: Archdiocese of New Orleans. Foster, Frances Smith. African American Review36, no. 3 (2002): 499-501. doi:10.2307/1512217. Hall, Gwendolyn Midlo. 2005. Slavery and African ethnicities in the Americas: restoring the links. Chapel Hill: University of North Carolina Press. Clark, Emily. Transcription of “Libro primero de Matrimonios de Negros y Mulatos en la Parroquia de Sn. Luis de la Nueva-orleans; en 137 folios da principio en 20 de enero de 1777 y acaba en 1830,” Archives of the Archdiocese of New Orleans. Jones, Hilary. The Métis of Senegal : Urban Life and Politics in French West Africa. Bloomington: Indiana UP, 2013. Print.